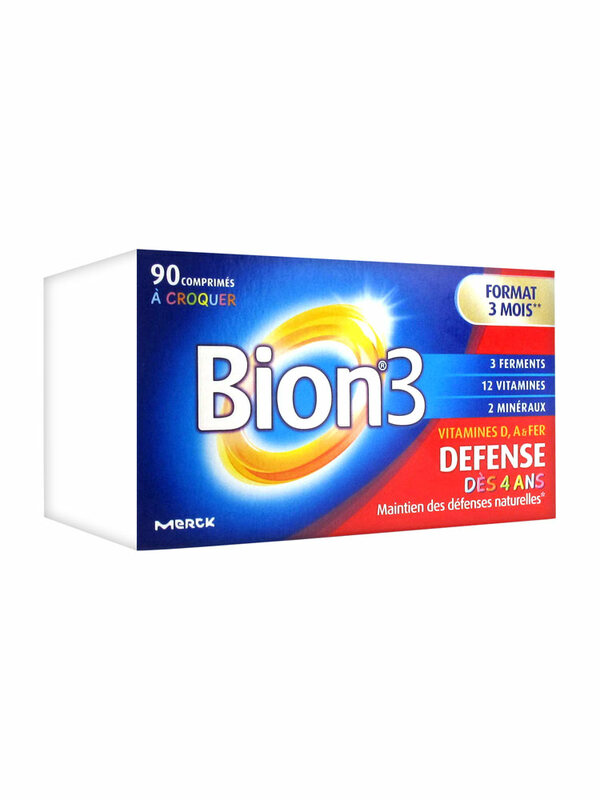 Bion 3 Defense Junior 90 Tablets to Crunch is a food supplement in form of tablet to crunch, based of 3 patented Tri-Bion ferments, vitamins and minerals (with sweeteners). - 12 Vitamins whose vitamin D, which contributes to the normal functioning of the immune system. - 2 Minerals: Zinc and Iron. - 3 patented Tri-Bion ferments that reach the intestinal flora, thanks to its adapted galenic. 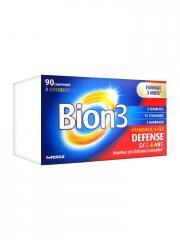 Bion 3 Defense Junior helps to maintain the natural defenses from 4 years! Take 1 tablet to crunch per day. It is recommended a duration of use of 30 to 60 days, several times per year. Indication: Vitality, nutritional balance, growth, immunity. Agent de Charge : Sorbitol; Carbonate de Calcium (Amidon de Maïs); Colorant : Poudre de Betterave Rouge (Maltodextrine); Ascorbate de Calcium; Huile de Colza Hydrogénée; Acidifant : Acide Malique; Préparation de Ferments Tri-Bion (Dextrine, Amidon de Maïs, Lactobacillus Gasseri PA 16/8, Bifidobacterium Bifidum MF 20/5, Bifidobacterium Longum SP 07/3. Peut contenir des traces de protéines de lait, de poisson, de soja et de phénylalanine); Fumarate de Fer (Huile de Palme Hydrogénée); Arôme Frambose; Anti-Agglomérant : Sels de Magnésium d'Acides Gras (Origine Végétale), Acétate de DL-a-Tocophéryle (Amidon Modifié); Nicotinamide; Oxyde de Zinc; Acétate de Rétinyle (Amidon de Maïs), D-Pantothénate de Calcium, Cholécalciférol (Saccharose, Amidon de Maïs, Huile de Palme); Biotine, Cyanocobalamine; Chlorhydrate de Pyridoxine, Mononitrate de Thiaine, Riboflavine, Édulcorants : Acésulfame K, Saccharine de Sodium; Acide Folique.